Denshi Danshi are back! After the retrospective “Fluid Dynamics” album which contained 90’s tracks and a couple of new productions, they are proud to present “Brain Chemistry”: an album completely made in the past two years and packed with 80 minutes of pure energetic dancefloor material! Compared to what’s following, “Parallel Universe” starts as a 145bpm ballad alternating strings and acid lines. Then you’ll be bewitched by the catchy melodies of “Starjna” before getting to the main course and a slightly reworked version of the highly psychedelic tempo-bewildering dancefloor hit “Leave The World Behind”! Now you can breathe with “Alpha Omega” a morning track that will make you raise your arms in the air! Following up is “Blink Of An Eye”, one of the most crazy tracks ever made by Denshi, full of twists and turns. 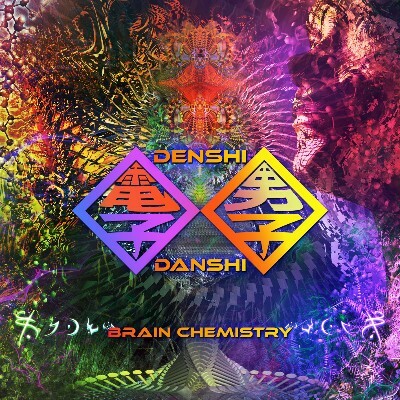 Then “Brain Chemistry” shows perfectly how Denshi Danshi can please any crowd: a mix of goa and modern elements! They’re not done with you: “Sukha” sounds definitely like a testimony of Denshi Danshi’s 90’s sound with plenty of gimmicks and surprising melodies! If you want to see the perfect example of a successful blend of oldschool and modern sounds aimed at the most explosive dancefloor experience, then “Lemmon 714” is for you! From underground parties in Israel to big festivals in Spain, the French duo makes a point of honour to blast any dancefloor they face. That’s why they spent a considerable amount of time testing and refining the “Brain Chemistry” tracks in their studios (yeah they have two), and had the implacable Tim Schuldt to master them! Enjoy!